Are NHS staff shortages causing a lack of basic care during childbirth? Ali Cloak considers new report findings that dangerously low staffing levels at present mean that half of women experience at least one ‘red flag’ event during childbirth. The study was launched by the National Childbirth Trust (NCT) and the National Federation of Women’s Institutes (NFWI) and involved a survey of 2,500 women who had given birth since 2014. The report entitled ‘Support Overdue: Women’s Experiences of Maternity Services 2017’ is the second produced by NCT and NFWI in collaboration. The study found that 50% of new mothers had experienced ‘red flag’ events during labour. 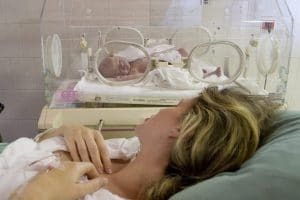 The term is given to describe specific warning signs of potential midwife shortage, as defined by the National Institute for Health and Care Excellence. Having to wait for more than an hour to be washed or to receive stitches after labour. Approximately 1 in 5 women did not see a midwife as often as they required in the post-natal period, which resulted in delayed diagnoses of medical conditions at a time which is critical for both mother and baby. Of these, 29% of the women were forced to visit their GP or A&E department instead as a result of the inadequate midwifery provision. The vast majority of women (88%) were not familiar with their midwife prior to going into labour. Worryingly, this finding is the same as that identified from the 2013 research, suggesting that continuity of midwifery care has not improved. Worryingly, the latest findings suggest that little progress has been made since their last publication, four years ago. Service providers are urged to take immediate action to implement the NICE (National Institute for Health and Care Excellence) guidance on safe staffing within maternity settings. Postnatal care must be improved. It should a minimum that women receive a postnatal home visit by the same midwife on at least two occasions. Current NICE guidance advises that women ought to be able to see a midwife as often as they require in the post-natal period. Maternity care providers must act immediately to ensure continuity of care. It is alarming to read that half of all women in labour experience a red flag event. This is a clear sign of maternity services in England and Wales being under great strain, with understaffing and under resourcing widespread. The NCT/NFWI report also stresses a number of concerns raised in the National Maternity Review, published last year, which set out a 5 year proposal for improving the outcome of maternity services. Injuries suffered around childbirth can be of the utmost severity, with lifelong effects, and therefore it is vital that care provided around this time meets an acceptable standard. As a solicitor who represents families with birth injury and maternal injury claims, I am pleased to see that the report is generating much publicity about the lack of resources and hope that this will help to bring about much needed improvement in the standard of care afforded to women and babies.